Lots of Headers: Choose from 5 types of headers with 3 types of scroll animations in 6 different colours, to make your header look truly special. You can make it rotate in 3D as it scrolls, and set Buy Now buttons in the header. It is your choice! Visual Composer: Worth $34, Using Visual Composer you can add and remove shortcodes to make your theme pages look instantly unique. 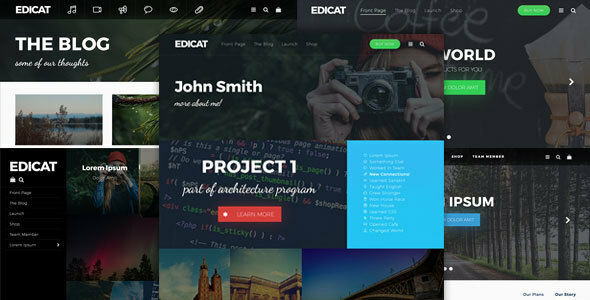 Edicat comes with more than 30 shortcodes that can be added to your pages to create shops, front pages, team pages and more. If you’re new to visual composer, we have also provided lots of templates to get you started. Lots of shortcodes: Whether you want to use our awesome slider with cuztomizable slides and lots of animations, or countdown, Edicat comes with lots of shortcodes built in so you can make the most of your website. User Interactions: Making a new post? With Edicat, your users can like that post to show their respect. Creating a gallery through Visual Composer? Users can like that image too. Many Different Pages: Edicat comes packaged with many different options to make pages. You can make Launch Pages with countdowns, Portfolio Pages, Team Pages, Product Pages and many, many more. We have provided default templates but the possibilities are endless. WooCommerce Ready: now you can sell all your items with our WooCommerce integration, in true style. Set up your WooCommerce pages or make some new ones with Visual Composer. You products will be flying off the virtual shelves! Blog Features: Want to let everyone know what you’re doing? With Edicat’s unique blog features you can do just that. Includes a blog header to show only your post formats rather than menu links for a truly blog centric experience. Check it out in our Live Preview above! Widget Combination: Comes with widget combination so that the most common widgets now don’t take up as much room. Combine your recent posts, recent comments and some other default widgets into one super widget! Business Ready: Whether you’re selling a product or telling a story about your business, Edicat can provide you with lots of shortcodes to do just that. Demo Import: Import one of our demos to get your site up and going super fast. That way you don’t have to start from scratch! Google Fonts: Comes with over 600 google fonts, so you’ll never get bored. 5 Icon Families: Bored of the same old icons all the time? Edicat comes with 5 icon families which you can put just about anywhere. That’s more than 1000 icons to choose from. Language Support: Comes with language files so you can set up your own translations. Awesome CSS3 animations and effects, from slider effects to slide in effects in the blog. Great integrated comment section that pops out on any page with comments. Set your blog up with masonry, or without. Infinite scroll on the blog, so your users don’t have to reload the next page. Compatible with IE9 and upwards, and all modern versions of Chrome, Safari, Firefox, Edge and Opera. Custom widgets including Custom Categories, Share This Post and Social Media Links. Save $39 due to visual composer being included. Blog post categories including aside, audio, gallery, video, quote and more. Archived blog posts will display differently and show media to users, so you can play audio clips or videos while in the archive. Responsive and Retina Ready, will work on mobile or desktop! Language Ready: theme comes in English and French, and works with qTranslate/WPML. This entry was posted in Wordpress Themes and tagged blog, business, depositfiles.com, download free, download rar, download theme.rar, download theme.zip, download wordpress theme, download zip, ecommerce, flat, free, free wordpress theme, get rar, get zip, Index Of, mirrorcreator.com, modern, multipurpose, nowdownload.ch, nulled, nulled theme, one page, page builder, Parent Directory, photography, portfolio, professional, rar, responsive, retina, ul.to, visual composer, woocommerce, zip, zippyshare.com by wordpress. Bookmark the permalink.